The word Pre Dreadnought is impossible to grasp without knowing more about the British Battleship HMS Dreadnought and her design. Her launch in 1906 sent political tremors through-out the world and firmed up Britain's dominance on the world seas. By the outbreak of war between Japan and Russia in February 1904 and the subsequent naval encounters that ensued were to change naval strategy once again. Anybody that still held the belief that a ram bow would be useful on battleships was shouted down once and for all after the battle of Tsushima. The Admirals of the world were baffled to hear hits were recorded at a distance of 7,000m at the battle of Tsushima. The "in-your-face" sea battles, at relatively short range, that were fought during the American Civil War were never to be seen again. Before Tsushima battleships were built with up to four of the heaviest guns and an array of intermediate calibers. Starting with the HMS Dreadnought, the new battleships did away with all middle size gun calibers to be equipped with a much larger number (8-12 typically) of the heaviest guns and a number of much smaller QF guns for defense against torpedo boats. HMS Dreadnought has been known as the first "all-big-gun" battleship. As battleships had evolved, battleships typically carried a maximum of four main guns in two turrets, one on center-line ahead of the superstructure, and one behind. HMS Dreadnought - a definite game-changer. What was new with HMS Dreadnought was that she carried a total of ten 12-inch guns - the equivalent of 2 1/2 pre dreadnoughts, but at a fraction of the cost. She was also the first battleship equipped with steam turbines which reduced her machine weight and increased her speed compared to contemporary battleships. Needless to say, by her launch all other navies were reduced to zero in terms of fighting power. 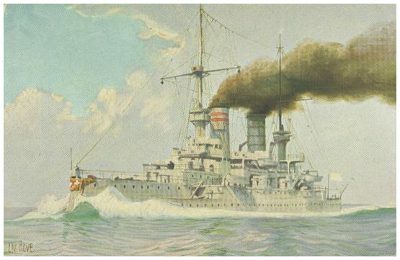 Ironically, the German Deutschland-class of battleships (SMS Deutschland, SMS Schlesien, SMS Hannover, SMS Schlesvig-Holstein, SMS Pommern) were all obsolete before they entered service. 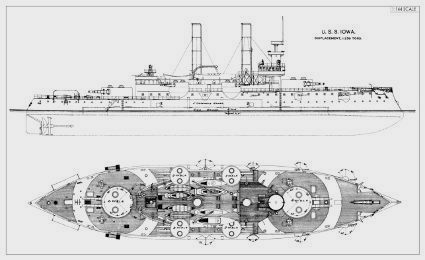 Previously ironclads and monitors had been built with iron or compound armor - which meant that in order to sustain a hit from a big gun you needed more of it, which increased the displacement and usually hampered speed, or range, or both. Also, up until the 1870's capital ships had carried rigging - masts and sail. By now that was all done with. 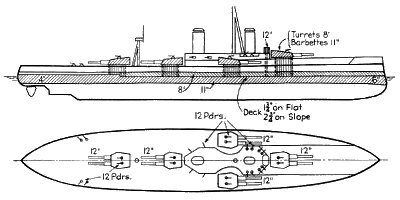 Pre-dreadnought plans - General Arrangement of USS Iowa BB-4. French plans were available for download from Service Historique de la Defence until just recently. I'm unable to conclude if the service was withdrawn or simply had it's URL changed. Not being able to read French doesn't help either in this instance. For anyone who knows more, please notify me through the contact page here, and I'll post it on this site. I've been looking for pre dreadnought kits for a long time, and I've found there are not a whole lot out there. Here are the few that I've found. It also seems that the market for this era of ships is perceived as soft by the manufacturers. As a result, the kits suffer from short runs and go out of production often. My policy is, if I find a kit at a fair price, I snag it. US Battleship USS Maine 1/240 scale by Pyro. Out of production and relatively rare. US Battleship USS Oregon by Glencoe 1/225 scale - old out of production but still plentiful on ebay. Imperial Chinese Battleship Chen Yuen and Ting Yuen by Bronco Models 1/350 scale. Currently in production. Imperial Russian Battleship Oriol 1/350 scale, by Zvezda and is getting scarce in the US. Imperial Russian Battleship Borodino and Knyaz Suvorov, both by Zvezda in 1/350 scale. The same here - the supply appears to be drying up in the US. I'm not sure if this kit is in production or not. Imperial Russian Battleship Potemkin, or St. Panteleymon by Alanger, Ark Models and others 1/400 scale. Seems to be in production again. Resin kits by Combrig in 1/700 and 1/350. They produce a model of almost any warship that ever floated. Well worth checking out. Most, if not all, are waterline models. Check ebay.